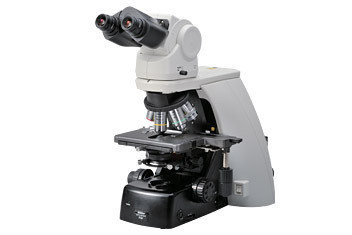 With its superior basic performance, bright and sharp optical system, flexible stratum structure and selectable motorized options, ECLIPSE Ni-U is the standard model in Nikon’s advanced upright microscope series. It can support a wide range of observations, from clinical examinations to bioscience research. 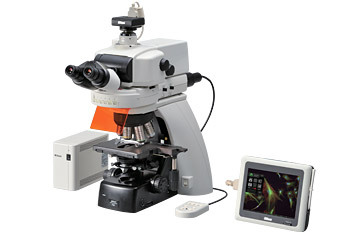 Nikon’s proprietary stratum structure enables simultaneous mounting of two optical paths on one microscope to support various applications. This structure allows double layer mounting of an epi-fluorescence illuminator, a photoactivation unit and a back port unit, developed for the first time for upright microscopes to enable simultaneous photoactivation and imaging, and simultaneous multichannel imaging. A motorized nosepiece, motorized epi-fluorescence cube turret and motorized shutter can be utilized depending on application. 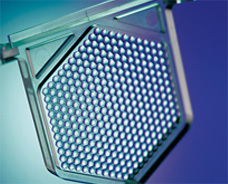 Employed for the first time in microscope objectives, this anti-reflective coating consists of nanometer-size particles. 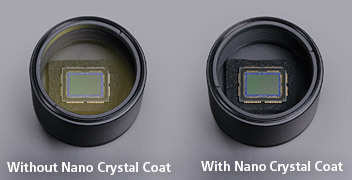 It is based on semiconductor manufacturing technology and is also used for Nikon camera lenses. 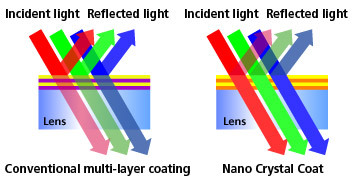 The coating’s coarse structure and the arrangement of particles in a spongy construction with uniform spaces between them achieve extremely low refractive indices. 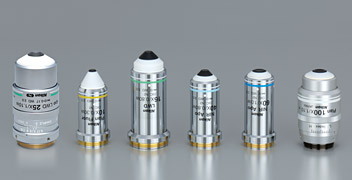 With remarkably high NA, greatly improved transmission in the long wavelength range thanks to Nikon proprietary Nano Crystal Coat, and chromatic aberration correction from 435 nm to 850 nm, these objectives are ideally suited not only for brightfield and DIC observations but also for fluorescent observations. These lenses allow observation of bright and clear images at any wavelength for near-IR imaging and multi-color fluorescence imaging. Because bright images can be captured even with a weak excitation light, damage to specimens is minimized. With a long working distance and high NA, these objectives provide excellent transmission in near IR wavelength range. The axial chromatic aberration of 40x and 60x objectives has been corrected to up to 850 nm, allowing high-resolution images of minute structures in thick specimens during IR-DIC observation. The 25xW MP and 100x objectives feature high NA and a long working distance. With chromatic aberration corrected in the IR region, these objectives are ideal for multiphoton excitation observation. In addition, by employing a mechanism to compensate for the changes in spherical aberration that occur at different temperatures and depths of observation points, clear images of areas deep within thick specimens can be captured. 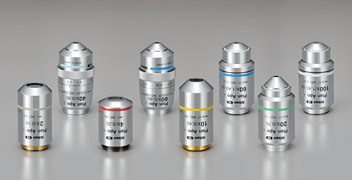 The “fly-eye” lens is ideally suited to diascopic illumination optical systems. Uniform and bright illumination up to the viewfield periphery is provided at any magnification. 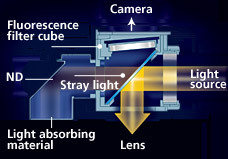 Nikon’s proprietary noise terminator mechanism is employed in the epi-fluorescence cube turret and filter cubes. The S/N ratio has been dramatically improved by thoroughly eliminating stray light in the filter cubes, allowing images of weak fluorescent signals to be captured with high contrast and brightness. 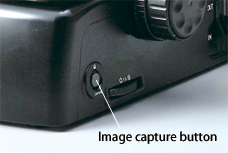 Images can be captured with Digital Sight cameras by simply pressing the image capture button located on the microscope base.